You’ve got to try snow tubing in the Pocono Mountains. It’s the easiest way to hit the slopes! Snow tubing in PA requires no special skills or equipment and is appropriate for almost everyone. Just bundle up and head for the hills—don’t forget your gloves and boots! 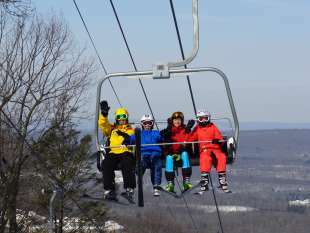 All six Pocono ski resorts have snowtubing hills. Age and height requirements vary by location. Check them out in advance and you’re good to go. Fly solo or race a friend down the snowy mountain chutes. Most facilities offer tubes for single riders. Some feature family-size snow tubes. Gentle “magic carpet” lifts make reaching the summit a cinch, so you can slide down again and again. Ready to ride at the best snow tubing in PA? Then browse our list of Poconos snow tubing facilities below at Blue Mountain Snow Tubing, Camelback Tubing, Shawnee Mountain, Jack Frost Big Boulder, Ski Big Bear, and White Lighting Tubing at Fernwood or join us at a Poconos tubing event! A Pocono Mountains sleigh ride is one of winter's favorite pastimes. Wrap up in a warm blanket next to your loved ones.